The Red Army invasion of Georgia (15 February – 17 March 1921), also known as the Soviet–Georgian War or the Soviet invasion of Georgia, was a military campaign by the Russian Red Army aimed at overthrowing the Social-Democratic (Menshevik) government of the Democratic Republic of Georgia (DRG) and installing a Bolshevik regime in the country. The conflict was a result of expansionist policy by the Russians, who aimed to control as much as possible of the lands which had been part of the former Russian Empire until the turbulent events of the First World War, as well as the revolutionary efforts of mostly Russian-based Georgian Bolsheviks, who did not have sufficient support in their native country to seize power without external intervention. After the February Revolution that began in Russia in 1917, Georgia effectively became independent. In April 1918 it joined with Armenia and Azerbaijan to form the Transcaucasian Democratic Federative Republic, but left after one month and declared independence as the Democratic Republic of Georgia on May 26, followed the next day by both Armenia and Azerbaijan. Georgia engaged in small conflicts with its neighbouring states as it attempted to establish its borders, though was able to maintain independence and de facto international recognition throughout the Russian Civil War, including being recognized by Soviet Russia in the Treaty of Moscow. Since early 1920, local Bolsheviks were actively fomenting political unrest in Georgia, capitalizing on agrarian disturbances in rural areas and also on inter-ethnic tensions within the country. The operational centre of the Soviet military-political forces in the Caucasus was the Kavburo (or Caucasian Office) attached to the Central Committee of the Russian Communist Party. Set up in February 1920, this body was chaired by the Georgian Bolshevik Grigol Ordzhonikidze, with Sergey Kirov as his vice-chairman. The Sovietization of the Caucasus appeared to Bolshevik leaders to be a task which would be easier to achieve while the Allied powers were preoccupied with the Turkish War of Independence; furthermore, the Ankara-based Turkish national government of Mustafa Kemal Atatürk had expressed its full commitment to close co-operation with Moscow, promising to compel "Georgia … and Azerbaijan … to enter into union with Soviet Russia … and … to undertake military operations against the expansionist Armenia." The Soviet leadership successfully exploited this situation and sent in its army to occupy Baku, the capital of the Azerbaijan Democratic Republic. Soviet military intervention was not universally agreed upon in Moscow, and there was considerable disagreement among the Bolshevik leaders on how to deal with their southern neighbor. The People's Commissar of Nationalities Affairs, Joseph Stalin, who by the end of the Civil War had gained a remarkable amount of bureaucratic power, took a particularly hard line with his native Georgia. He strongly supported a military overthrow of the Georgian government and continuously urged Lenin to give his consent for an advance into Georgia. The People's Commissar of War, Leon Trotsky, strongly disagreed with what he described as a "premature intervention", explaining that the population should be able to carry out the revolution. Pursuant to his national policy on the right of nations to self-determination, Lenin had initially rejected use of force, calling for extreme caution in order to ensure that Russian support would help but not dominate the Georgian revolution; however, as victory in the Civil War drew ever closer, Moscow’s actions became less restrained. For many Bolsheviks, self-determination was increasingly seen as "a diplomatic game which has to be played in certain cases". On the night of 11-12 February 1921, at Ordzhonikidze's instigation, Bolsheviks attacked local Georgian military posts in the predominantly ethnic Armenian district of Lori and the nearby village of Shulaveri, near the Armenian and Azerbaijani borders. Georgia had taken over the Lori "neutral zone" in a disputed Armeno–Georgian borderland on the pretext of defending the district and approaches to Tiflis in October 1920, in the course of the Turkish–Armenian War. The Armenian government protested, but was not able to resist. Shortly after the Bolshevik revolt, the Armenian-based Red Army units quickly came to the aid of the insurrection, though without Moscow's formal approval. When the Georgian government protested to the Soviet envoy in Tbilisi, Aron Sheinman, over the incidents, he denied any involvement and declared that the disturbances must be a spontaneous revolt by the Armenian communists. Meanwhile, the Bolsheviks had already set up a Georgian Revolutionary Committee (Georgian Revkom) in Shulaveri, a body that would soon acquire the functions of a rival government. Chaired by the Georgian Bolshevik Filipp Makharadze, the Revkom formally applied to Moscow for help. By 17 February, Soviet infantry and cavalry divisions supported by aircraft were less than 15 kilometers northeast of Tbilisi. The Georgian army put up a stubborn fight in defense of the approaches to the capital, which they held for a week in the face of overwhelming Red Army superiority. From 18 to 20 February, the strategic heights of Kojori and Tabakhmela passed from hand to hand in heavy fighting. Georgian forces under General Giorgi Mazniashvili managed to push the Soviets back inflicting heavy losses; they quickly regrouped and tightened the circle around Tbilisi. By 23 February, the railway bridges had been restored, and Soviet tanks and armoured trains joined in a renewed assault on the capital. While the armoured trains laid down suppressing fire, tanks and infantry penetrated the Georgian positions on the Kojori heights. On 24 February, the Georgian commander-in-chief, Giorgi Kvinitadze, bowed to the inevitable and ordered a withdrawal to save his army from complete encirclement and the city from destruction. The Georgian government and the Constituent Assembly evacuated to Kutaisi in western Georgia, which dealt the Georgian army a significant morale blow. Despite Moscow's military successes, the situation on the Caucasus front had become precarious. 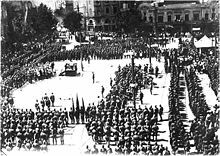 Armenians, aided by the Red Army involvement in Georgia, had revolted, retaking Yerevan on 18 February 1921. In the North Caucasus, Dagestani rebels continued to fight the Soviets. The Turkish occupation of Georgia's territories implied the near certainty of a Soviet–Turkish confrontation, and the Georgians repeatedly refused to capitulate. On 2 March Lenin, who feared an unfavorable outcome to the Georgian campaign, sent his "warm greetings to Soviet Georgia", clearly revealing his desire to bring hostilities to an end as quickly as possible. He emphasized the "tremendous importance of devising an acceptable compromise for a bloc" with the Mensheviks. On 8 March, the Georgian Revkom reluctantly proposed a coalition government, which the Mensheviks refused. Despite the Georgian government’s emigration and the demobilization of the National Army, pockets of guerrilla resistance still remained in the mountains and some rural areas. The invasion of Georgia brought about serious controversies among the Bolsheviks themselves. The newly established Communist government initially offered unexpectedly mild terms to their former opponents who still remained in the country. Lenin also favored a policy of conciliation in Georgia, where a pro-Bolshevik revolt did not enjoy the popular backing claimed for it, and the population was solidly anti-Bolshevik. In 1922, a strong public resentment over the forcible Sovietization indirectly reflected in the opposition of Soviet Georgian authorities to Moscow's centralizing policies promoted by Dzerzhinsky, Stalin and Ordzhonikidze. The problem, known in modern history writing as the "Georgian Affair", was to become one of the major points at issue between Stalin and Trotsky in the last years of Lenin's leadership and found its reflection in "Lenin's Political Testament". The 1980s wave of Mikhail Gorbachev's glasnost ("publicity") policy refuted an old Soviet version of the 1921–1924 events. The first Soviet historian, who attempted, in 1988, to revise the hitherto commonly accepted interpretation of the Soviet-Georgian war, was a notable Georgian scholar, Akaki Surguladze, ironically the same historian whose 1982 monograph described the alleged Georgian worker revolt as a truly historical event. Modern Georgian politicians and some observers have repeatedly drawn parallels between the 1921 events and Russia’s policy towards Georgia and Western Europe's reluctance to confront Russia over Georgia in the 2000s, especially during the August 2008 war. ^ "iveria". Retrieved 1 November 2014. ^ "Советско-грузинская война 1921 г. (Soviet-Georgian war of 1921)". Хронос ("Hronos") (in Russian). Retrieved 2006-11-02. ^ Suny. The Making of the Georgian Nation. pp. 185–190. ^ Suny. The Making of the Georgian Nation. pp. 191–192. ^ Carr, E.H. (1950). The Bolshevik Revolution 1917–1923. Vol. I. London: MacMillan & Co. pp. 342–343. ^ Gachechiladze, Revaz (2012). "Geopolitics and foreign powers in the modern history of Georgia: Comparing 1918 – 21 and 1991 – 2010". In Jones, Stephen F. (ed.). The Making of Modern Georgia, 1918 – 2012: The first Georgian Republic and its successors. New York City: Routledge. pp. 22–23. ^ Suny. The Making of the Georgian Nation. pp. 207–209. ^ Ėkshtut, Simon (September 2014). "ЮРИЙ ТРИФОНОВ:ВЕЛИКАЯ СИЛА НЕДОСКАЗАННОГО" (PDF). Rodina. Archived from the original (PDF) on 2016-01-18. ^ a b c Beichman, A. (1991). The Long Pretense: Soviet Treaty Diplomacy from Lenin to Gorbachev, p. 165. Transaction Publishers. ISBN 0-88738-360-2. ^ "Glossary of Events: Georgian Affair-1921". Encyclopedia of Marxism. Retrieved 2006-11-02. ^ Hovannisian, Richard G. (1996). The Republic of Armenia, Vol. IV: Between Crescent and Sickle. University of California Press. pp. 287–289, 405. ISBN 0520088042. ^ Арутюнов, Аким Александрович (Arutyunov, Akim Aleksandrovich) (1999), Досье Ленина без ретуши. Документы. Факты. Свидетельства. (Lenin’ Dossier without Retouching. Documents, Facts, and Evidences). Moscow: Вече (Veche). ISBN 5-7838-0530-0 (in Russian). See also an abridged online version of the book. ^ a b c d e Lang, DM (1962). A Modern History of Georgia, pp. 234–236. London: Weidenfeld and Nicolson. ^ This pamphlet by Trotsky is perhaps the best known book justifying the invasion. It was a rebuttal to Karl Kautsky's work which declared Georgia to be a democratic socialist workers and peasants republic. Trotsky, Leon (1922), Between Red and White: a study of some fundamental questions of revolution, with particular reference to Georgia (Social democracy and the wars of intervention) Archived 2005-02-04 at the Wayback Machine. Encyclopedia of Marxism. Retrieved on 17 April 2007. ^ "Тифлисская операция 1921 (Tiflis Operation of 1921)". Большая советская энциклопедия (БСЭ) (Great Soviet Encyclopedia) (in Russian) (3 ed.). 1969–1978. Archived from the original on 2007-09-29. ^ "V.I. Lenin. The Question of Nationalities or "Autonomisation"". Encyclopedia of Marxism. Retrieved 2006-11-02. ^ King, Charles (2008), The Ghost of Freedom: A History of the Caucasus, p. 173. Oxford University Press, ISBN 0-19-517775-4. ^ Saakashvili Urges for EU's Help. Civil Georgia. 2008-05-12. ^ Saakashvili Address on Russia’s Abkhazia, S. Ossetia Recognition. Civil Georgia. 2008-08-26. ^ Georgia’s Statehood Under Danger, Resist Enemy Everywhere – Government Tells the Nation. Civil Georgia. 2008-08-10. ^ Lee, Eric (Autumn 2008), Global Labor Notes / Russia invades – and the labour movement is silent Archived 2009-07-25 at the Portuguese Web Archive. Democratiya. ^ "Georgia: 25 February Declared 'Soviet Occupation Day'". Stratfor. Archived from the original on 7 March 2012. Retrieved 1 November 2014. ^ Civil Georgia. "25 February Declared Day of Soviet Occupation". Archived from the original on 3 August 2012. Retrieved 1 November 2014. (in Russian) Борисова, И.Д. Российско-грузинские межреспубликанские связи 1917–1922 гг. / И.Д. Борисова // PANDECTAE: сб. ст. преподавателей, аспирантов и соискателей каф. гос.-правовых дисциплин юрид. фак. ВГПУ. – Владимир: Изд-во ВГПУ, 2004. * Stephen F. Jones (October 1988). "The Establishment of Soviet Power in Transcaucasia: The Case of Georgia 1921-1928". Soviet Studies. 40, No. 4 (4): 616–639. JSTOR 151812.